Celsius is the world's first and only negative calorie drink, backed by multiple clinical studies. Studies show that drinking a great tasting Celsius before exercise helps you burn up to 100 calories and more per serving, boosts metabolism, reduces body fat, increases endurance and provides lasting energy. Celsius is powered by MetaPlus®, a blend of ingredients designed to work together to increase calorie burning over a three-hour period. 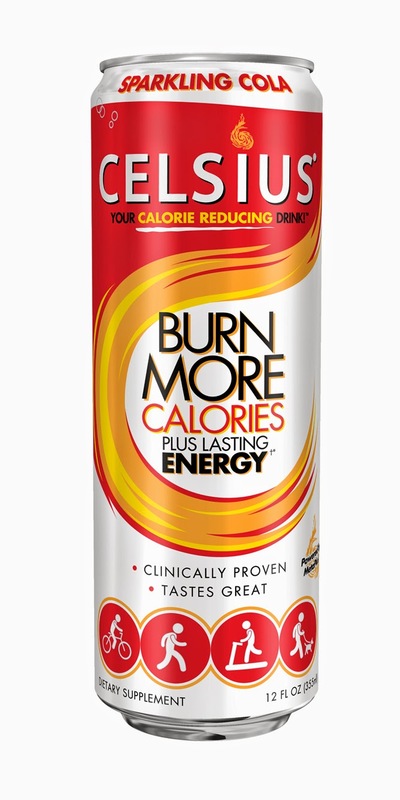 The formula is the result of years of research and testing and while the mix is proprietary, consumers readily recognize and trust the healthier blend of its ingredients such as: Green Tea with EGCG, Ginger, Calcium, Chromium, Caffeine, Guarana, and Vitamins B & C. Celcius recently launched a new flavor, Sparkling Cola. One person will win a 4-pack of Celsius Sparkling Cola. I think the wild berry would probably be my favorite. Celsius Raspberry Acai Green Tea would be a flavor that I would love to try. We're not big soda drinkers, but the Celsius Raspberry Acai Green Tea sounds yummy! First I'd try the Sparkling Cola flavor. I would love to try the cola flavored. I would like to try thr Speakling wild berry. the raspberry acai green tea sounds amazing. I want that peach mango. Since I love coke, I would try the sparkling cola. I think the sparkling cola sounds good. Id love to try the Sparkling Cola flavor. I would like to try the Celsius Raspberry Acai Green Tea. I am a HUGE Coke fan, so of course I want to try the Sparkling Cola!! I think peach mango sounds really good. I would like to try the Sparkling Orange flavor. I would like to try the Speakling wild berry. I would like to try the Celsius Raspberry Acai Green Tea flavor! I would like to try the Peach Mango Green Tea the most. I'd like to try Celsius Sparkling Orange. Sparkling cola would be nice. Peach Mango Green Tea sounds great! I'd like to try the Celsius Sparkling Orange. I really want to try the Peach Mango! Sounds great!! Sparkling Cola would be my flavor of choice! I would probably like the peach mango green tea the best. I would like to try the Sparkling Wild Berry. I would love to try the Sparkling Orange Flavor. i want to try the cola flavor. I would like to try Sparkling Wild Berry. I would love to try Peach Mango Celsius! i'd like to try the sparkling cola flavor! I would most like to try the Sparkling Orange flavor.